Russell Brown (closest) and associate test the strength of a new carbon mast from Innovative Composite Engineering by hiking out to resist the pulling force applied by two lines. During a visit with Russell Brown last summer at his shop in Port Townsend, Washington, we caught up on changes he has made to his 18‘ 5“ (5.6m) PT Skiff and an 11‘ (3.35m) two-part nesting tender—both designed by Paul Bieker/Eric Jolley—that Brown and his wife, Ashlyn, offer as plywood kits. Don’t let the word plywood fool you; these are quite sophisticated boats, highly refined to make assembly, operation, and subsequent maintenance as pleasing and easy as possible. Employing alignment notches, scribe marks, slots, and tongues to guide assembly of the CNC-cut parts, amateur builders can produce a professional-looking boat. As another example, the hardware that connects the bow and stern sections of the nesting dinghy, designed to be taken apart and stored with one section nested in the other, is the latest iteration of clever connectors that Brown has developed over some years, wanting them to be simple, quick to operate, and capable of preventing water from entering either hull section. The two sections can be assembled in the water, with the person kneeling or crouching in one section. An expert in making small carbon/epoxy parts, he was employed by the builders of Oracle’s 2010 America’s Cup catamaran. 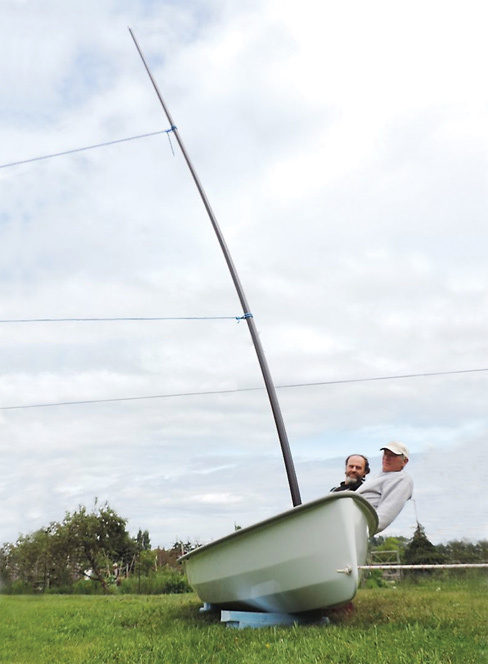 Innovative Composite Engineering makes all the spars for Brown’s 11′ (3.35m) nesting-dinghy sail kit. 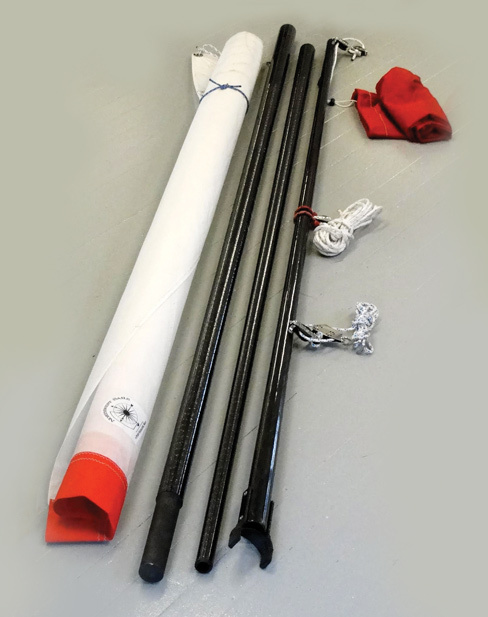 A logical extension of the nesting-dinghy design was development of a sailing rig that includes a freestanding two-part carbon fiber mast, boom, associated hardware, and sail with sleeve to slide over the mast. Brown buys the carbon tubes from Innovative Composite Engineering (ICE) in White Salmon, Washington. ICE began 27 years ago specializing in carbon fiber tubes, now in a range of diameters (0.100“–24“), and wall thicknesses (0.01.0“–4“), very fine OD and ID tolerances (0.002“–0.004“), and in lengths up to 20‘ (6.1m). Resin systems include epoxies, cyanate esters, bismaleimide (BMI), and their own proprietary formulations, paired with reinforcements such as aramids (carbon fiber), E-glass and S-glass, Astroquartz (a silica-grade fabric created for NASA by JPS in 1964), and coated fibers such as texalium, which is often passed off as carbon but actually may be fiberglass—whole or in part—with a very fine coating of aluminum. A variety of finishes are available: machined, abraded, sanded, taped, and custom labeled. Processes: mandrel wound, bladder, and compression molded. ICE occupies a 65,000-sq-ft (6,045m2) facility, manufacturing as few as one to two parts a year for some customers, to more than 1,000 production parts per week. Machining is offered in steel, aluminum, and composites. Bonding and assembly plus value-adds such as applied graphics round out the list of services. Innovative Composite Engineering, 1265 N. Main Ave., White Salmon, WA 98672 USA, tel. 509–493–4484, website www.innovativecomposite.com. PT Watercraft, PO Box 1875, Port Townsend, WA 98368 USA, tel. 360–385–2645, website www.ptwatercraft.com.